This inaugural post from our partners at Bridging the Gap is written by Naazneen Barma and Brent Durbin, who will be coordinating contributions from BTG’s network of scholars. Take a moment to think back to college – or whenever you decided to pursue the path that has brought you here, reading about world politics and sundry related topics on the Duck of Minerva. What set you on this path? What made you want to devote years of your life to studying politics, perhaps even through formal graduate training? If you’re like us, you looked out and saw a puzzling and imperfect world, and you wanted to develop the tools to understand it more clearly. Perhaps, in the heady confidence of your youth, you even wanted to make it a better place. As graduate students in political science at UC Berkeley in the early 2000s, we found ourselves hungry for opportunities to tie our studies to policymaking and the “real world.” Both of us had come to Berkeley from Washington, DC, and we wanted to find ways to connect to our old networks, as well as to parlay our research into new policy opportunities. In the first few years of our PhD studies, it wasn’t obvious that this would be possible. Then two things happened.First, we discovered a group of like-minded students at Berkeley who, under the guidance of Steve Weber, would begin the work that has evolved into the Bridging the Gap project. And second, we found that there were many in the discipline who felt the same way – even if they couldn’t always tell their colleagues or advisors about it. One important marker of this community was the emergence of the Duck of Minerva in 2005, which introduced a new channel for conversation among others like ourselves. We’re thrilled to join the Duck this fall as editors of a new “Bridging the Gap” channel. (Special thanks to Josh Busby for proposing this idea, and to the other editors for welcoming us aboard.) 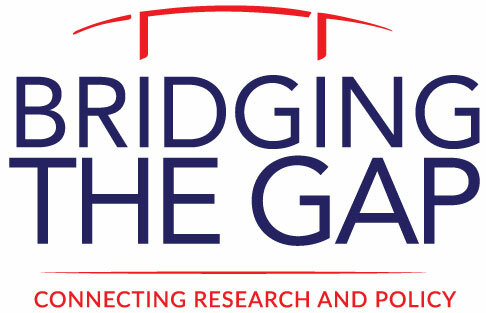 As Josh mentioned in his introductory post, Bridging the Gap (BTG) is an effort to build stronger connections between scholars and the policy world, both by providing professional development and networking opportunities, and by generating policy-relevant research. If you are reading the Duck, you almost certainly know one or more of the hundreds of scholars who have been through our programs, which include the New Era Conference for graduate students and postdocs, the International Policy Summer Institute for faculty, and several research initiatives. We also edit the Bridging the Gap book series at Oxford University Press, which publishes rigorous scholarship that also has clear policy implications. This year, we initiated the Policy Engagement Fellowship program to support scholars in developing research-informed public engagement in a specific international policy area. The origin of the Bridging the Gap concept is no mystery. In 1993, Alexander George produced a path-breaking book that set out to “encourage better communication and closer collaboration between academic scholars who study foreign policy and practitioners who conduct it.” Bridging the Gap: Theory and Practice in Foreign Policy was both a study and a model of the kind of two-way engagement George felt was essential for improving research and practice in international affairs. George saw problems on both sides of the gap. First, practitioners had a poor understanding of concepts and history, leading them to miscalculate strategic options in policymaking. Second, scholars failed to give enough attention to research questions that would be helpful for improving policies, and were ill-equipped to translate their research for policy audiences. These challenges remain. In fact, in some ways they’re getting worse, as policymakers face an ever-expanding stream of data and commentary across new and old media, and scholars adopt increasingly esoteric methods for studying politics. The need for expertise in policymaking may be more acute than it has ever been. And still, the two communities – scholars and policymakers – remain poorly equipped to talk to each other. It’s been nearly 15 years since Steve Weber created a space for a handful of students to explore the intersection of rigorous scholarship and policy influence. Those early efforts – in which Ely Ratner and Matthew Kroenig were also key players – have developed into a network of scholars creating ground-breaking research in almost every area of international, comparative, and foreign policy scholarship. One of our major goals with this Bridging the Gap channel is to share this rigorous and exciting work with you in the coming months. In addition to research-based expertise from BTG affiliates, we will feature advice on how to connect scholarship with policy, including topics such as how to find a receptive policy audience for your expertise, and how to translate your work to make an impact. While these topics are covered on the Duck already – Josh’s six-part series is a great place to start – we hope our channel will add some new voices and ideas to the mix. We will also host a “Book Nook” series, which will present two-minute videos of authors talking about their recent books. Since Brent’s book on CIA reform is hot off the presses, his video will kick-off the series in the coming days. Thanks again to the Duck editors for inviting us to join the lively and vital conversation. Stay tuned for more, and let us know if there are certain questions or topics you’d like us to address. On behalf of our fellow BTG co-directors Jim Goldgeier, Bruce Jentleson, Jordan Tama, and Steve Weber, we look forward to an engaging semester!